Why are some European cities cycling mad? And how can other cities copy their infrastructure? ECF spoke to Kalle Vaismaa, co-author of the book “Best European Practices in Promoting Cycling and Walking”. Working for the Transport Research Centre at the Tampere University of Technology, Vaismaa spent more than two years researching the best cycle infrastructure that Europe has to offer and compiling it into a 269 page book packed full of colour photos and diagrams. It’s easy to see why people were eager to get their hands on this gem. The book looks at some of Europe’s most famous cycling cities with insight into cycling greats such as Groningen, Strasbourg, Amsterdam and Copenhagen. And it comes as no surprise as to which countries do cycling infrastructure best. Vaismaa was keen to tell ECF that cycling cities aren’t created overnight. It takes careful planning, money, resources and political will. Vaismaa is adamant that quality infrastructure is essential: Helsinki has more than 1200 kilometres of cycle paths, while Copenhagen only has 400. Yet Copenhagen still manages more than three times as many cyclists. Why? It focuses on high-quality cycle segregated infrastructure. The great thing about this book is that it doesn’t just show what exists but explains how cities got there. For example, Ghent’s (Belgium) beautiful medieval centre was still filled with cars in the 1990s, and their original bicycle plan met stiff resistance. Yet a sustained and long-term vision allowed them to plan for cyclists and pedestrians. Today it’s the countries No. 1 cycling city. “It took time for these cities to get there, so don’t expect it all in one go. But you should look at infrastructure in Copenhagen and Groningen and say this is where I want to be,” adds Vaismaa. Vaismaa wants people to use this guide as a practical and visual tool for anybody wanting to know what sort of infrastructure and planning they should put in place in their city. 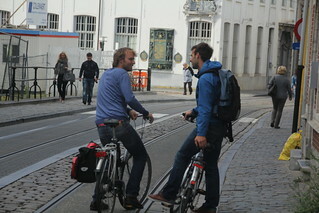 About the Book: Best European Practices in Promoting Cycling And Walking. The material for the book has been gathered in a Finnish research project called PYKALA during 2009–2011. In the project there were ten European example cities, which are forerunners on the international level. The book offers the latest knowledge to promote cycling and walking. It gives broad points of views, solutions and ideas to planners and decision makers in cities, municipalities and public administration.